You’ve got to see Pooh and Tigger’s button craft projects they made with Jimmie recently, because they’re so adorable! I mean, seriously cute! Plus, they’re perfect for Valentine’s Day, and so easy to do. If you don’t have a Jimmie in your life to make these sweet canvas craft projects with your kids, I’m truly sorry. But you’ll just have to do it with them yourself! I know everyone remembers Jimmie, my gorgeous sister, right? You know how she likes to give Coach and me a date night every so often? And, you know how she came down and hung out with the girls so Coach and I could go away for our anniversary last month? Yeah, she’s awesome like that! This is what they did while we were away, and once again, she made it a wonderful weekend for my sweetie and me! Thanks, Jimmie! We love you bunches! For example, last date weekend I planned a hiking excursion with a picnic lunch in the middle of it. (If you are into arachnids and drama queens, you can read about it here.) Valentine’s Day two years ago saw us making a massive paper banner chain that we hung all through the living, dining and kitchen rooms at Martie’s old house [you can read that one here]. In the winter months, date nights mean a Wii dance party for me and the nieces and by the end of those competitions (which I never win), we are all exhausted and sweaty and feel pretty good about the pizza we ate and subsequently burned off. Lately I’m interested in crafting with Pooh and Tigger. I’m typically not very creative or crafty on my own, and when I am, I typically want to attempt a craft that is either way hard (meaning I will never succeed) or way easy (meaning I can succeed and not feel like a failure after trying the way hard craft). 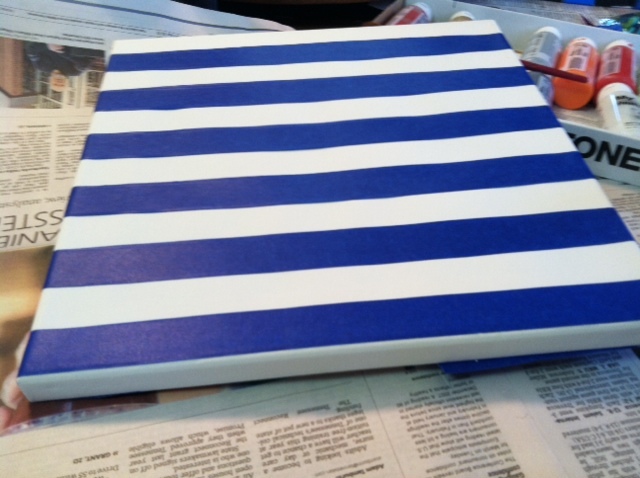 This craft I want to feature today was way easy. I saw the idea on someone’s blog, who stole it from another blogger who saw it on Pinterest about eleventy-frillion times, so if this was your idea originally, thanks for sharing. I’d credit you but I have no idea who you are. Well done, though, really. Very cute. 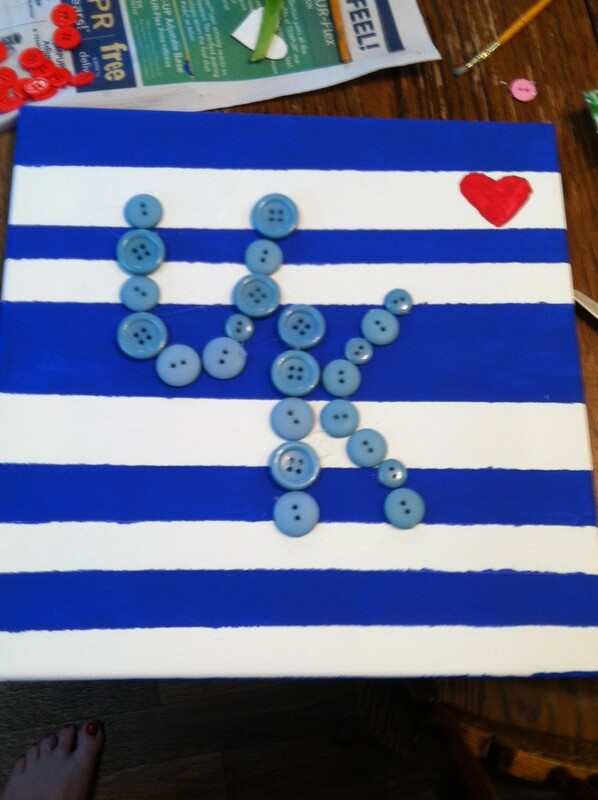 The girls and I made these adorable button heart crafts (Madre hearts the University of Kentucky, clearly). Madre’s , made just for me! Go Cats! Buttons, one color, and far more than you think you need (from Wal-Mart, purchased over three separate trips because I was sure that THIS TIME I had purchased enough. I had not. Who knew button craft projects would require so many buttons? Okay, now down to business. Then, and this is key, really smash down the painters tape. Really smush it good. If you don’t, the paint will bleed under the tape and your lines will not be pristine. I won’t tell you how I know this, but you can rest assured I do. 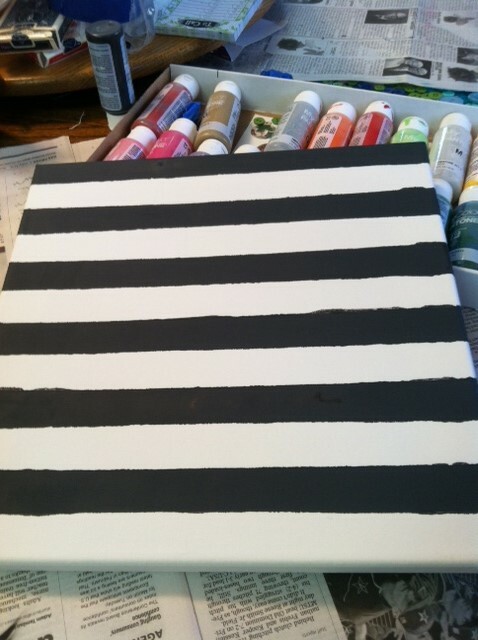 Your next step is to paint the blank spaces. Choose whatever color you like, but I recommend something dramatic and dark, especially if you choose a bright colored buttons. I used gray. Do a couple of coats. Make sure there’s no white in your formerly blank spaces. Let dry, and go have a snack. Next, draw a heart onto the paper. You can use the old trick of folding the paper in half, drawing the half heart, and then cutting out the one side and opening to have a whole heart. Make sure it doesn’t look stupid or wonky. Place paper heart onto center of canvas and trace the outside edges of it lightly onto the canvas, so you can begin your button art designs. Admire your button craft projects from a distance, so as not to see the fuzzy lines and all the glue under the buttons. Show it off to your friends and then hang it in your bathroom. 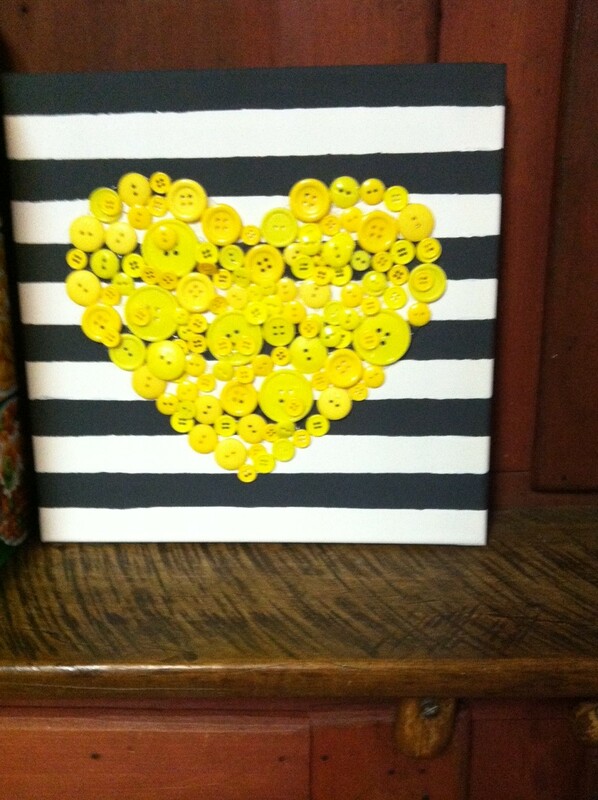 I personally like to use my button heart craft as a reminder that I am loved even when I’m not perfect. Viola! A craft! And one that looks good pretty much any way you cut it. Didn’t we do well? Yes, Jimmie, you guys did well! And, once again, I loved coming home to something awesome that my girls made! I’m not at all surprised that Madre didn’t follow instructions, but I must say, hers is my favorite! We’ll have Jimmie for a guest post anytime, won’t we? Have a wonderful Monday, and I’ll see you all back on Wednesday for what’s making waves! Nice! I’ve been missing Jimmie’s blog–I hope I’m not off her list. I’ve also been hoping if she’s not blogging, she’s working on a novel or a novelized memoir of her life up to now…with very little embellishment. You two grew up with a bunch of characters, so with very little exaggeration they could people quite a book.